Open Top Vertical Batch Tanks come standard with bolt-on lid, a polyethylene hinged lid option is also available. Tanks are manufactured from medium-density polyethylene with U.V. inhibitors and are designed for the containment of liquids up to 2.0 specific gravity. Tank walls are translucent for level viewing and equipped with liter and gallon indicators. 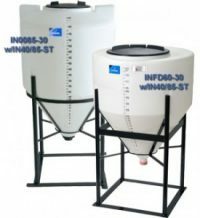 Open Top Vertical Batch Tanks are designed for indoor applications. Perfect for batch chemical/mixer mounting systems as well as many other applications. 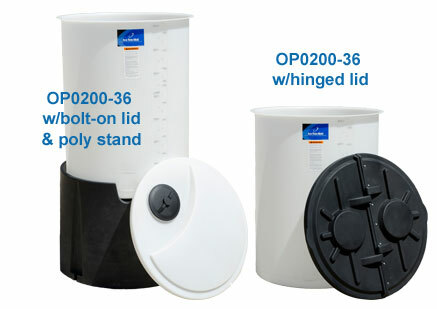 All tanks feature 8″ lids and one standard fitting. 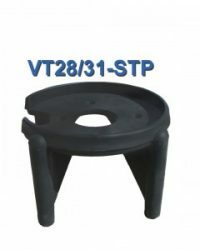 Both polyethylene and metal stands (when used with Vertical Stand Adaptor) are available for the Vertical Batch Tanks.